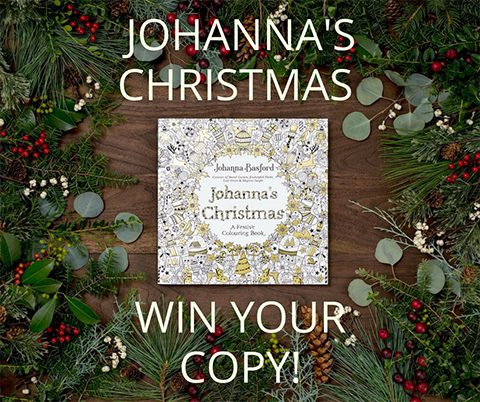 ﻿ Amelia's Magazine | Johanna Basford presents Johanna's Christmas: Giveaway and Interview Exclusive! 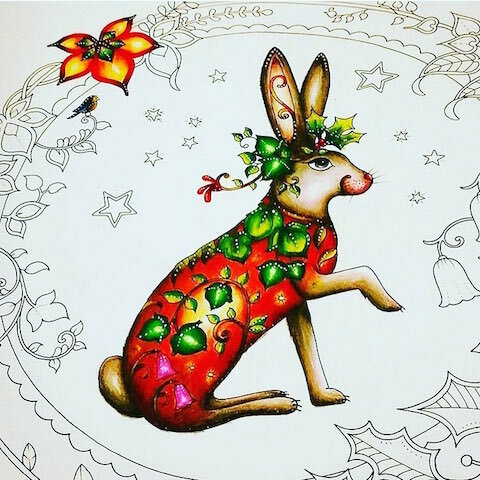 The latest adult colouring book by the phenomenonal Johanna Basford is released this week, a crafty Christmas colouring book designed to be used in multiple ways. 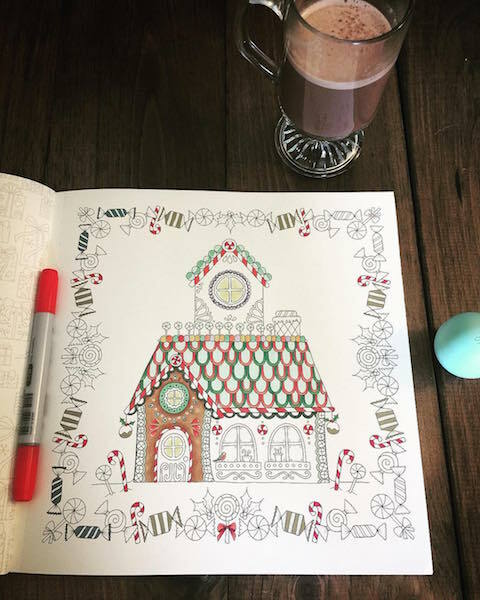 As Johanna herself is fond of saying “I make colouring books so you can make masterpieces!” Colouring has moved out of books and spread through the crafting community, and Johanna perfectly captures this moment with a book of one sided images on perforated pages that can easily be removed to share as Christmas cards, decorations, gift tags… or whatever you dream of doing. 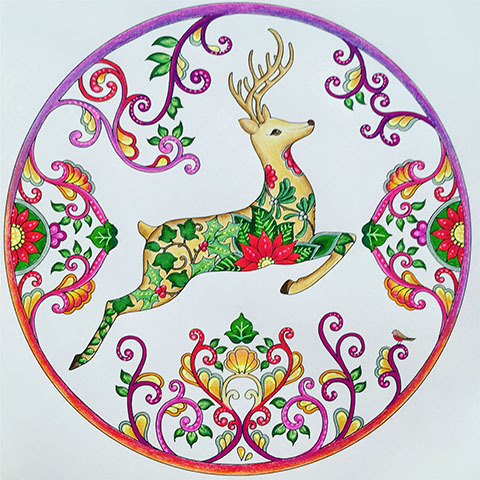 “Johanna’s Christmas: A Festive Colouring Book (Colouring Books) ” is chock full of traditional Christmas imagery such as deer, festive birds, trees, presents, gingerbread, sleighs, bells, baubles, stockings, curlicues and a series of hidden robins. 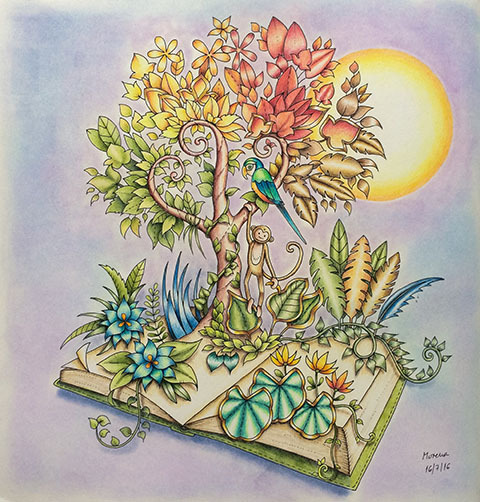 Expect a mix of evocative narrative scenes, her signature mirror images and more of her ribbon designs, where decorative elements stretch across the page. Johanna’s Christmas is a book sure to engage fans old and new, and best of all, I have THREE copies to give away so hop on over to my Facebook Page HERE and leave a comment telling me what you love most about Christmas time to be in with a chance to win… better still, the giveaway is OPEN WORLDWIDE, so if you live outside the UK this is your chance to get the book with a gold foiled cover! Now read on for my exclusive interview, in which we also discuss her last release Magical Jungle . 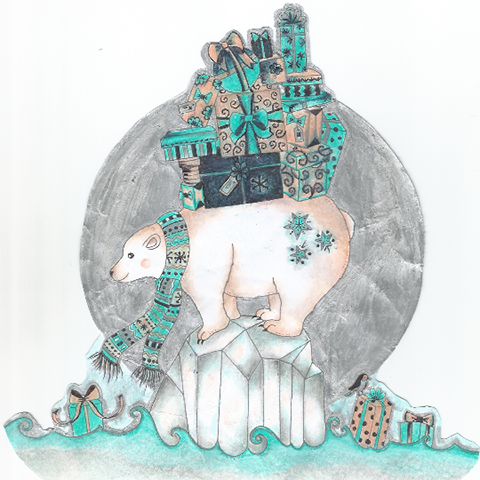 The winners of Johanna’s polar bear Christmas colouring competition: Sydney, Sarah P, Kocialka, Jenny and Chiblla. 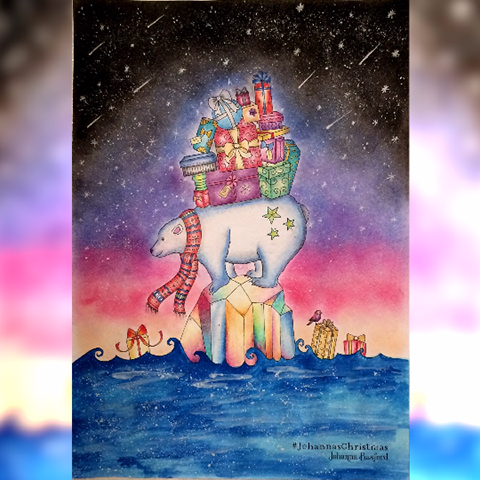 Read why Johanna chose these versions of her polar bear here. How did you choose your top colourists to receive advance copies of your new book? They were all Colourists who’s work had caught my eye on social media or on my colouring gallery (or I watch their YouTube channels!). I liked the fact that instead of trying to woo traditional journalists or book reviewers, we were getting the books straight into the hands of colourists so they could start making some masterpieces! What are your favourite coloured pages, and why? Literally far too many to choose from! It’s like asking a mother which of her children is her favourite! I think the great thing about colouring is that you never see the same image twice and that every colourist brings something completely new to the black and white drawings. Having said that, I’m always partial to a stunning background technique. Those people that do the ‘starry night sky’ effect will never fail to amaze me! You create an incredible amount of pages for each new book – do you ever find yourself getting bored of drawing a particular object, and if so, how do you make it exciting? I genuinely never get bored of drawing! Admin? Yes. Digital updates? Yes. Drawing? Never! I think nature is an amazing, unlimited melting pot of inspiration and although every jungle is leafy, no 2 leaves are the same! 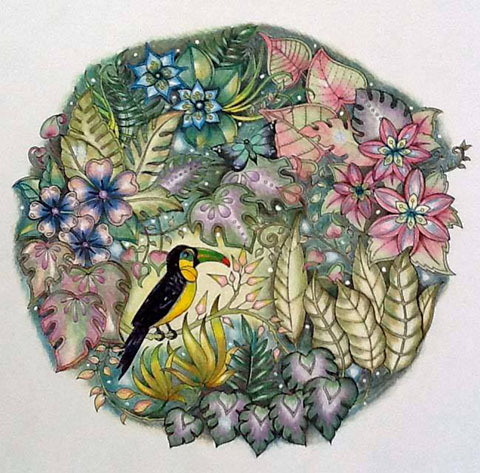 I spent hours pouring over foliage reference books and sweating it out in the Botanical Garden hot houses admiring every type of leaf and vine you can imagine – there was not shortage of inspiration! 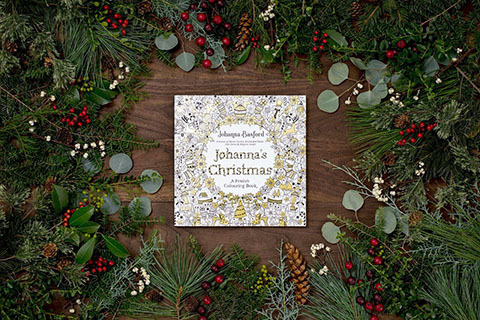 How did you source the specialist paper used in Magical Jungle and Johanna’s Christmas? I worked with the Penguin US team to find a paper that was the perfect weight, texture, tooth and colour for my books. After rejecting many, many samples, we worked with a paper manufacturer to make my very own paper that matched my ideal specifications perfectly. Think of it as paper couture! It was a huge honour to have this opportunity to get THAT geeky about paper. We then used the spec of this paper as the benchmark for all my foreign publishers, which in this instance includes the UK, to match their paper to. There will always be slight difference and nuances between paper stocks, (it is after all a product of nature and no 2 trees are the same!) but we aim to create consistant, beautiful books across the world that offer colourists the finest papers on which to make their masterpieces and develop their creative practice. 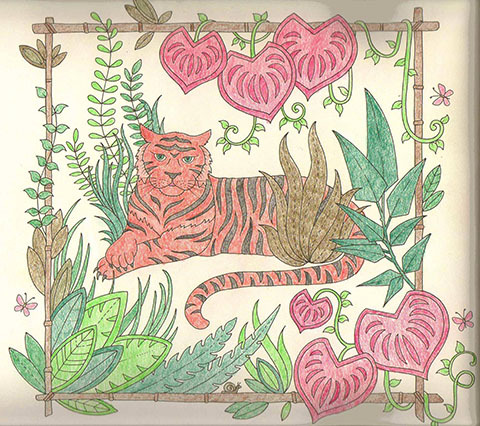 How much have you listened to colourists in the making of Magical Jungle? Everyone seems to be very happy about the fact that the images don’t go into the spine, for example. A LOT. This is a partnership, a collaboration. If one half of the require need certain things in order to make the best final outcome, then it’s up to me to supply them with what they need. 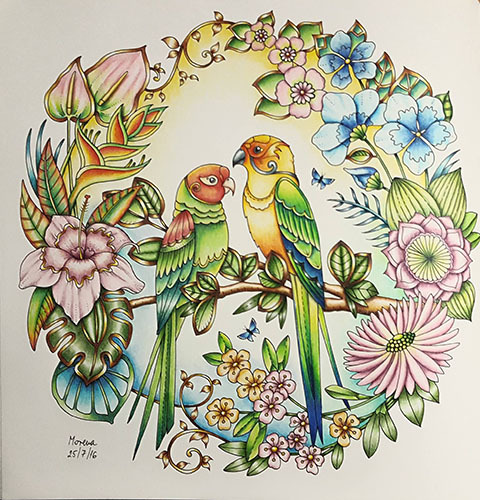 I’m very active on social media and value my place in our colouring community, it would be entirely odd to be in this space, communicating with colourists and not take notice of what they say! It’s a privilege to have this job and as I always say, I make books so Colourists can make masterpieces! Roughly how many hours went into Magical Jungle? Heaps! A book takes me about 5 months to draw, then another few months in production with the publisher. I also have a few months at the start to mull over ideas and research. The reality is I never stop thinking about a book when I’m in the midst of creating it, I even dream about my books! Book signings are always lovely as it’s a chance to meet the people behind the profile pics! I spend so long interacting with the colouring community online that it a real treat to finally say hello and give them a hug in person! And yes, there’s been a few that I’ve known online for some time now that travelled huge distances to come along to the events, it’s very humbling and also very special to finally get a selfie with them! 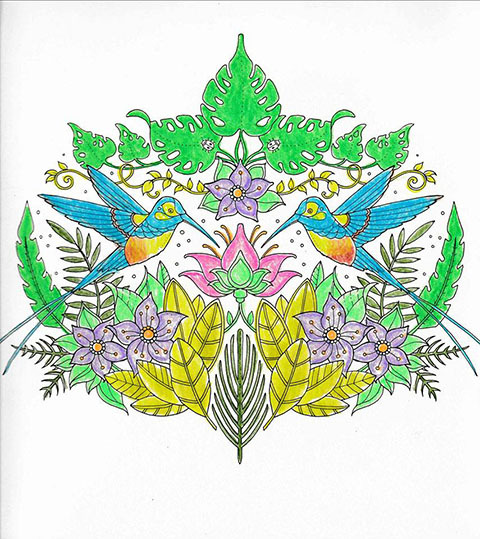 As you create more colouring books have you found yourself getting more into the act of colouring itself? There seems to be quite a demand for your tutorials! Yes. 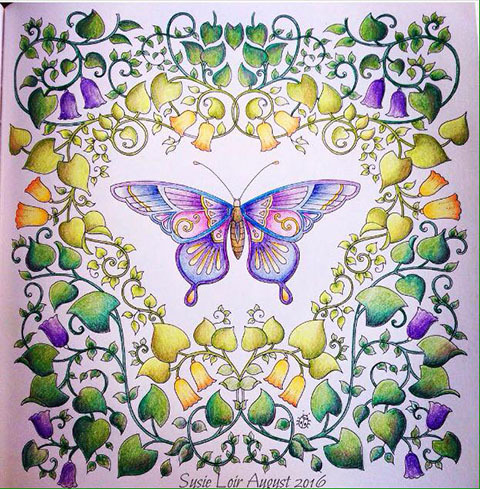 Initially I was hesitant to share my colouring as I felt my role was to create the artwork, not colour it. 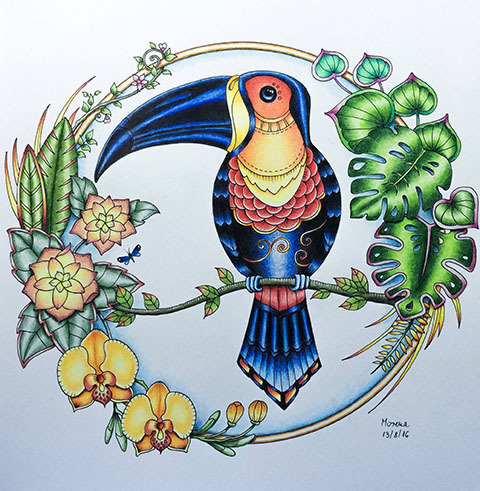 I’ve always enjoyed working in coloured pencil though and did a lot of this type of work when I was at school because colouring pencils were so accessible (a 17 year old has a rather limited materials budget!). I colour a lot, it’s important to test run the artwork and check the shapes and scale are suitable for colouring, the line weight is just right and also that the paper is good. And of course, it allows me to test a lot of pens and pencils so when people ask questions about what art supplies work well, I can give an honest and informed answer. I guess it’s like being a chef; you have to taste your food to know if it’s good or not! 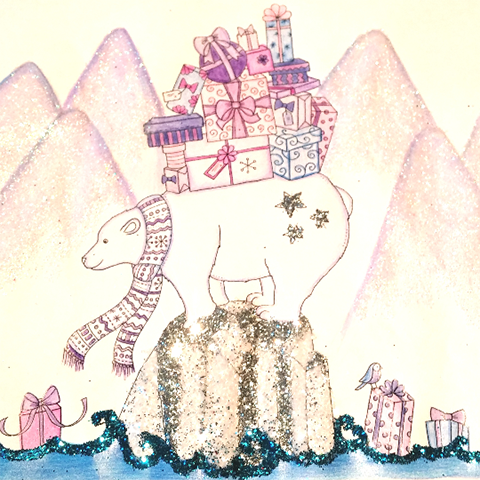 What can we expect from your upcoming Christmas book? 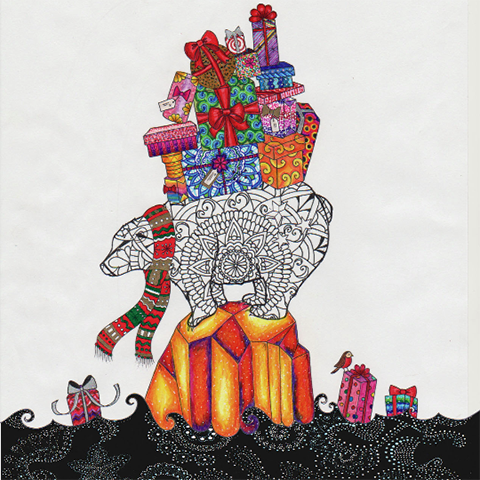 I’ve tried to capture the sense of excitement, charm and whimsy of the festive season within the pages of this book. There’s an owl in a Christmas jumper, a robin delivering gifts, lots of tangles of holly and ivy and some beautiful big poinsettia blooms! 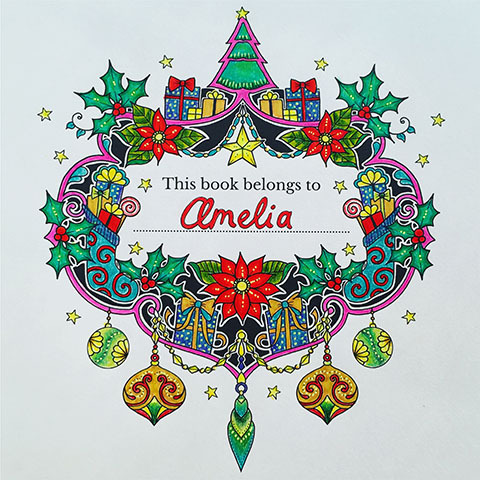 In total there are 37 illustrations, all printed single sided and with a detachable spine so Colourists can remove their creations when complete and share them as Christmas gifts or use them in craft projects. 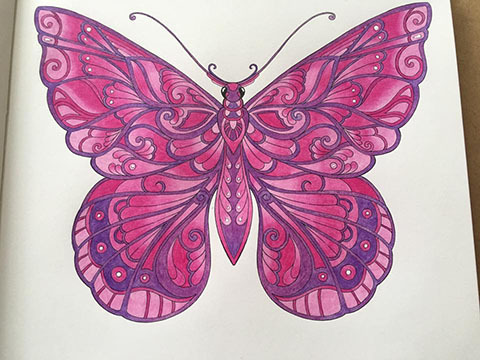 It also means some art materials likes solvent based markers and heavy glitter pens can be used without fear of bleeding through to the design on the reverse. Finally, there’s no list of things to find in this book, instead there is a flock of festive robins hidden throughout the pages for you to find. Can you tell us about the musical notes on the front cover? I’m not the musical one in my family (my sister is!) 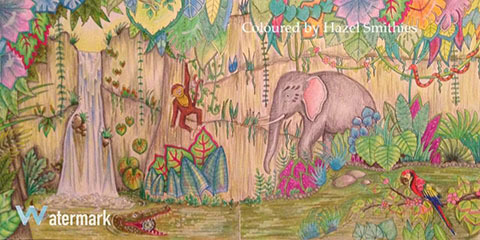 so when I drew a few bars of music flowing along the front of the cover and posted a WIP sketch on facebook, the colouring community were quick to point out the my scribbly notes were back to front and upside now – musical gibberish! Thank goodness for feedback – that could have been embarrassing if that went to print! 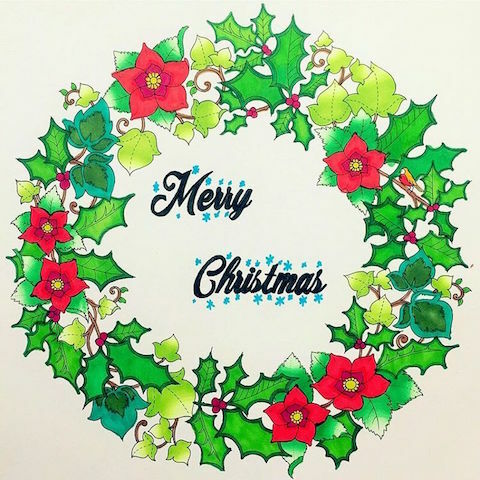 I amended the cover and now those musical notes play out the first 4 bars of Jingle Bells. 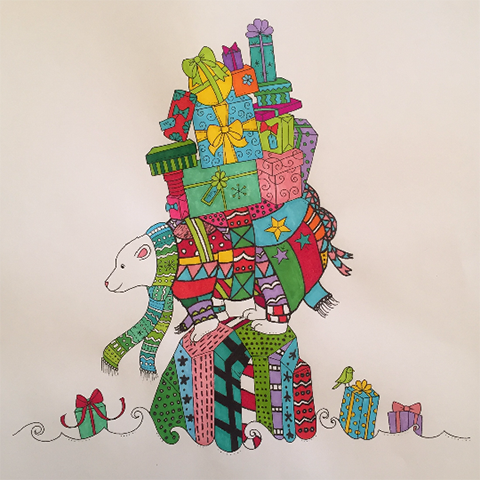 I love that the colouring community helped shape the cover and that now there’s a secret little hidden festive reference in those notes at the bottom. Jingle all the way! What is your starting point when you hide something on a page, and why did you choose a robin? Usually I hide as many things in a book as possible. I love tiny details and things you have to search for. When I was little we would often visit Brodick Castle on the Isle of Arran where there was chair carved by Robert Thompson (aka Mouseman). He carved a little mouse onto every piece of furniture he made, it was like a little hidden signature. 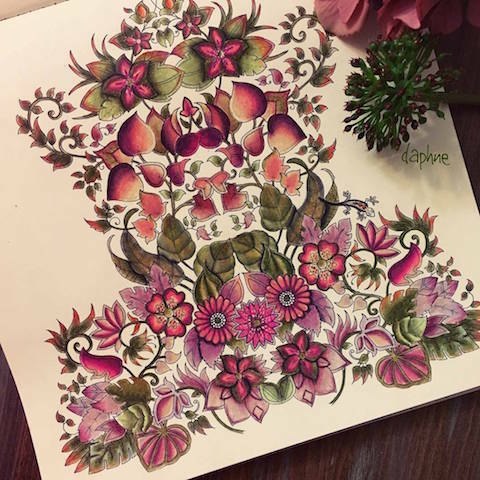 I loved that charming way of stamping his work. 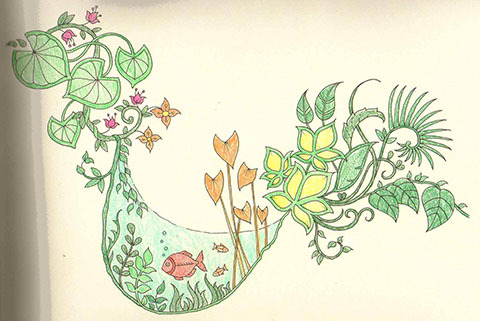 I try to do something similar by hiding little intricate details in all my drawings. 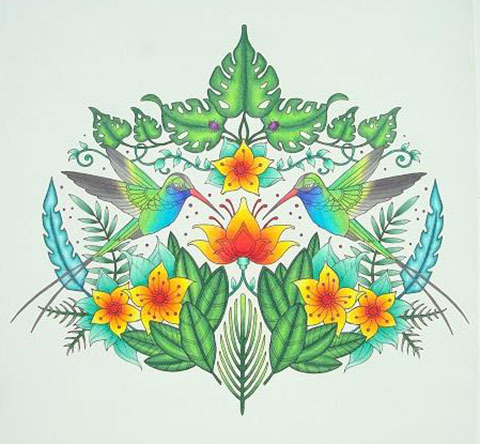 This can be anything from a butterfly to a lizard but for Johanna’s Christmas I wanted a single festive motif that people could find. The robin seemed perfect. Also, who doesn’t love spotting a robin on a snowy morning? They are like nature’s treasure hunt! I draw the entire picture first, then add the hidden elements at the end, so I can find the perfect hiding place for them! How will you be celebrating Christmas this year? What family traditions do you have? Food. Lots and lots of food! I tackled Christmas dinner myself once many years ago and swore I’d never do it again! There was a terrifying incident involving turkey giblets… My skills lie firmly in helping with the washing up! I like all the traditional elements of Christmas day, the crackers on the table, the awful jokes inside, cheap paper crowns, mountains of crumpled wrapping paper and perhaps best of all, the left overs! Cold kilted sausages (I believe these are called Pigs in Blankets to the rest of the world outside of Scotland!) are my favourite Christmas evening snack! 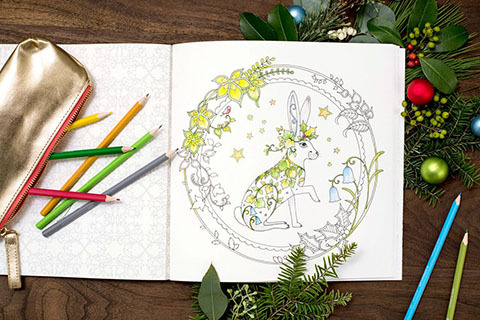 I’ve just completed a project with Canon to create 4 new colouring images that can be downloaded throughout the year and a wonderful collaboration with Method, the cleaning products company. I have some limited edition products launching with them next year that I cannot wait to share with the world! 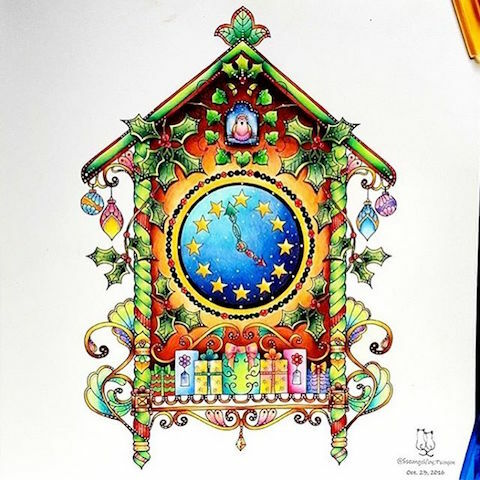 We’re also putting the final touches to some colouring books marks, a candle and home fragrance collection (with scents I helped develop inspired by books!) 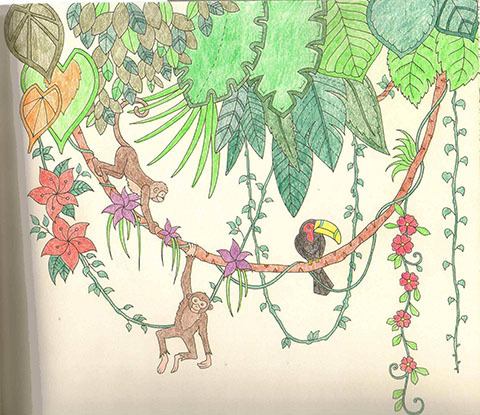 and just this morning I spoke with my jigsaw puzzle partners about the Magical Jungle puzzles we’ll be launching soon. 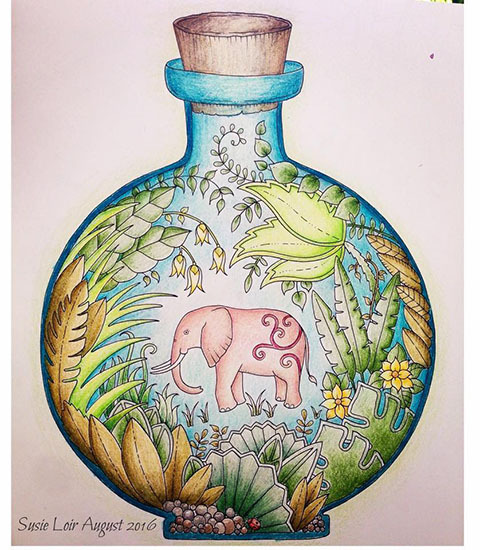 Magical Jungle tutorial by Chris Cheng. And of course, there is a new book in the pipepline – but I’m keeping that a bit secret for now! 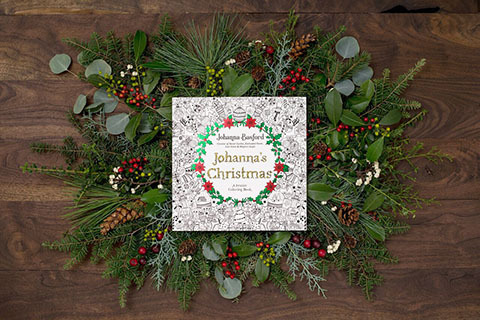 Johanna’s Christmas is published by Virgin Books/Penguin Books. Win your very own copy of this book by telling me your favourite thing about Christmas in the comments on my Facebook Page HERE. THREE winners will be picked on Saturday 12th November. OPEN WORLDWIDE. Or order your books from Amazon – these are affiliate links so if you order through them you will help support this website. Thank you!